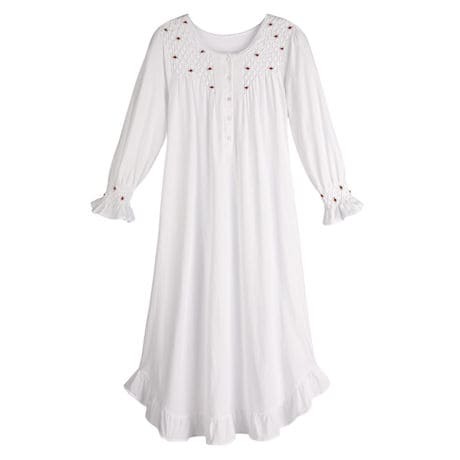 Smocked, gathered, scattered with tiny rosebuds and leaves, trimmed with lace and ruffles, this is the perfect nightie. Knit from pure cotton, it's soft, lightweight but cozy, and machine washable. Front button placket, 3/4-length sleeves. Size M hangs 49". Imported. S(6-8), M(10-12), L(14-6), XL(18), 1X(18-20), 2X(20-22), 3X(22-24).